art for everyone. every monday morning. Early in the 20th Century, Cleveland, Ohio was a mecca for young modernist painters. Known as the “Cleveland School,” they gathered in the Kokoon Arts Club to paint and draw. August Biehle became became the creative spark that lit their passion for modern art styles just taking shape in Europe. Born to a master decorator in Germany, Biehle followed his father’s career path. After the family emigrated to Cleveland, he learned commercial painting, as well as how to cut stencils for wall decorations from teachers well versed in the decorative art patterns of Art Nouveau. He learned from his father as they decorated walls in Cleveland, Alliance, Canton, St. Louis, Chicago and Cincinnati. All aboard! By the age of 18 he was ready to move beyond decorative arts and left to study art in Europe. From that time forward, Biehle always kept one foot in America and the other in Europe. In Munich he enrolled at the Kunstgewerbeschule, a progressive school for arts and crafts. Then back to northeast Ohio to work as a decorator in the Youngstown area. Then back to Munich to study at the Royal Academy of Fine Arts. Then back to Cleveland to work as a color artist and demonstrator for the Sherwin-Williams Paint Company and then a lithographer. Remember, this was the first decades of the 20th Century. Cross-Atlantic travel was not as easy as jumping on an airplane and flying from one ultra-modern airport to another. In Munich he mixed with leading modernists like Wassily Kandinsky and Franz Marc and the artists they attracted from across Europe. Biehle took their new style across the Atlantic as Cleveland and Munich became the hubs at either end of the Expressionist axle moving modern art forward. Biehle, the slight young Sherwin-Williams paint demonstrator became the messenger between the two camps as the Kokoon Arts Club became modern art’s American clubhouse. There, Biehle rubbed shoulders with a string of avant garde artists, looking for new artistic ideas. 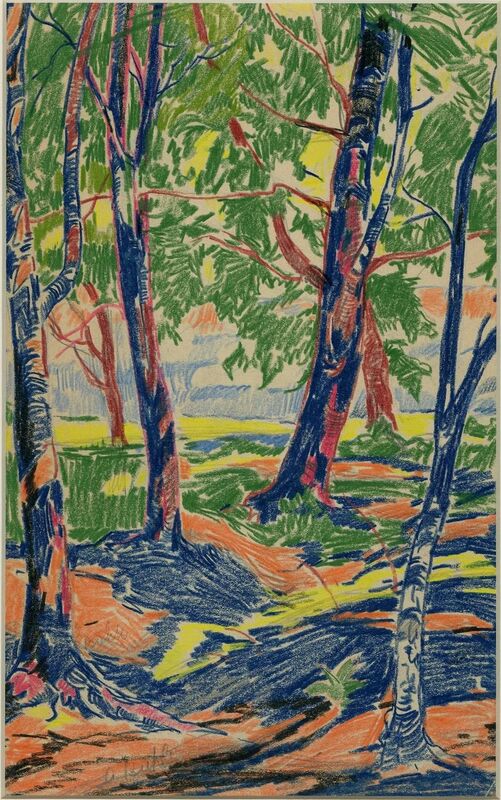 Biehle continued to explore Expressionism for over twenty years before beginning moving on to Cubism, another European modern art style. 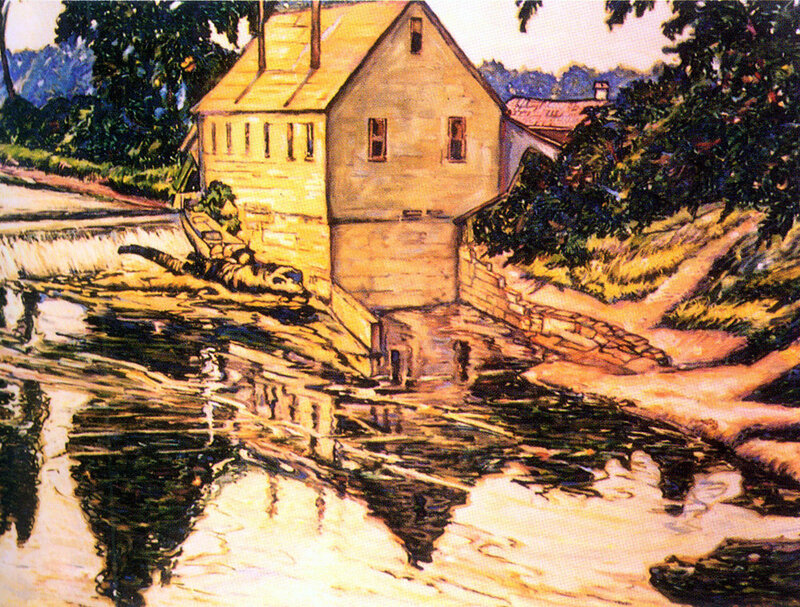 His best known works are industrial landscapes, and more bucolic canvasses featuring the small historic town of Zoar, just south of Canton. This small town, with it’s German roots, became a favorite place to visit, and Biehle established a vacation home in the village’s former Print Shop. Half a century later, the back porch built for his 50th birthday present became a meeting room for a group of advertising artists and writers working under the direction of this writer. Biehle’s paintings hung throughout the office, providing a creative spark to a new generation. ”Biehle was part of Henry Keller’s “summer school” that flourished from 1919 to 1921 in Berlin Heights, Ohio, where students came to paint and learn from the leader of the ‘Cleveland School’." 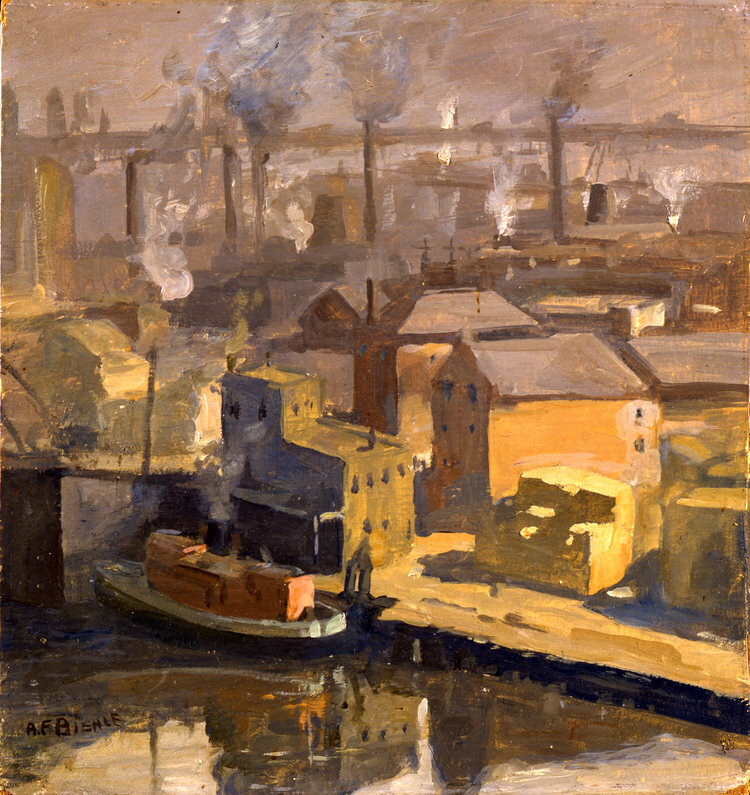 ”Biehle’s use of Cleveland factories and urban scenes were common in modernist paintings of the 1920’s and 30’s." ”Biehle’s interest in the Blaue Reiter (The Blue Rider) group infused his work with both Germanic emotion and precise craftsmanship." Biehle Timeline. Scroll over images to see timeline. Born in Germany, son of August F. Biehle, Sr., a master decorator. Biehle family emigrated to the United States and settled in Cleveland, Ohio, where there is a large community of German immigrants. Returned to Germany to further his art education. Initially trained in Art Nouvelle, a decorative style. Bounced between Cleveland, Paris and Munich advancing his art education and brought new artistic styles and thinking to both sides of the Atlantic. In Munich he was exposed to Der Blaue Reiter (The Blue Rider) art exhibitions organized by modernists Wassily Kandinsky and Franz Marc. In the same year he returned to Cleveland where he became a color artist and demonstrator at the Sherwin-Williams Company. He later worked for commercial printers as a poster designer for over three decades. He fell under the influence of American Scene Painters, a group reacting against the abstract expressionists (including Kandinsky) who were growing in popularity in Europe. He created a series of boldly-colored landscape paintings done in Zoar and Berlin Heights, Ohio, reflective of a post-impressionist style. During this time he married his wife, Mary. Experimented with more abstract modernist styles, leading to a series of cubist and even abstract expressionist works. Continued to produce increasingly abstract works using urban and rural scenes as background. During his retirement years he spent great amounts of time in his Zoar, Ohio, cabin that had once served as the Zoar community’s print shop. Died at his Cleveland home, a painter until the end. 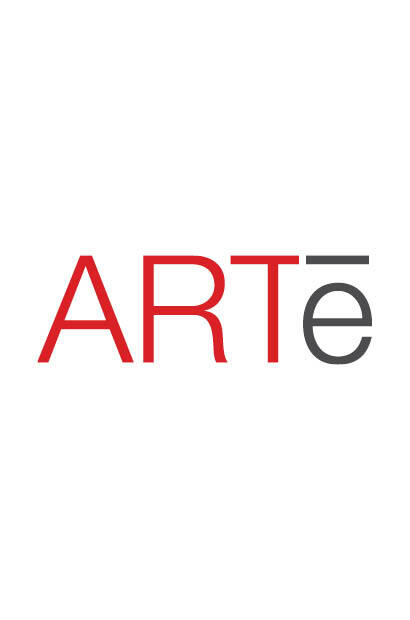 Subscribe to receive new ARTe stories in your inbox every Monday morning!